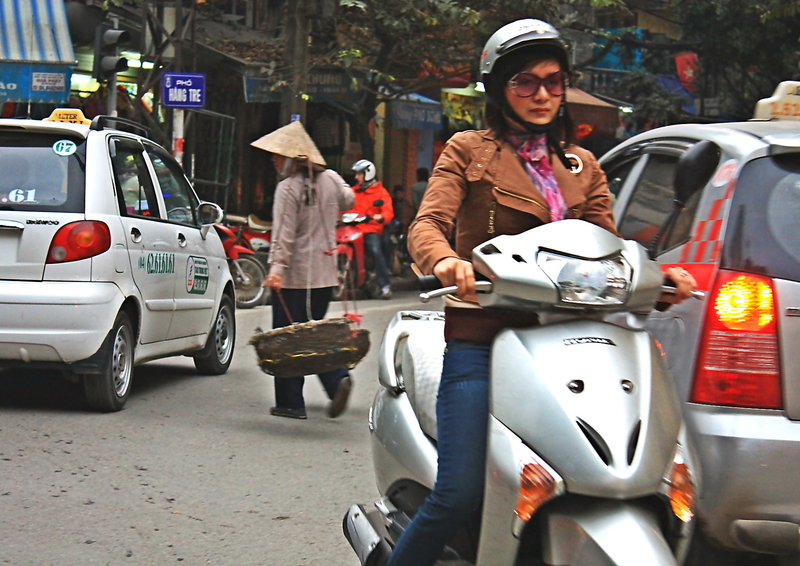 Hanoi is a fast paced and colorful city where ancient culture and modern practices collide. Hanoi offers visitors a vastly different experience as opposed to Ho Chi Minh City due to its fusion of Chinese, Vietnamese and French influences. Although Hanoi is Vietnam’s second largest city most visitors tend to focus on the vibrant Old Quarter and the nearby Hoan Kiem Lake area . One of the most iconic images of Hanoi is Hoan Kiem Lake. It is a memorable experience to stroll around this scenic lake in the evening when the lights of the bridge and pagodas are lit up and reflected in the water. After a long day of sightseeing visitors can relax on one of the surrounding benches and enjoy an ice cream or a cup of coffee; a favorite pastime with locals as well as tourists. 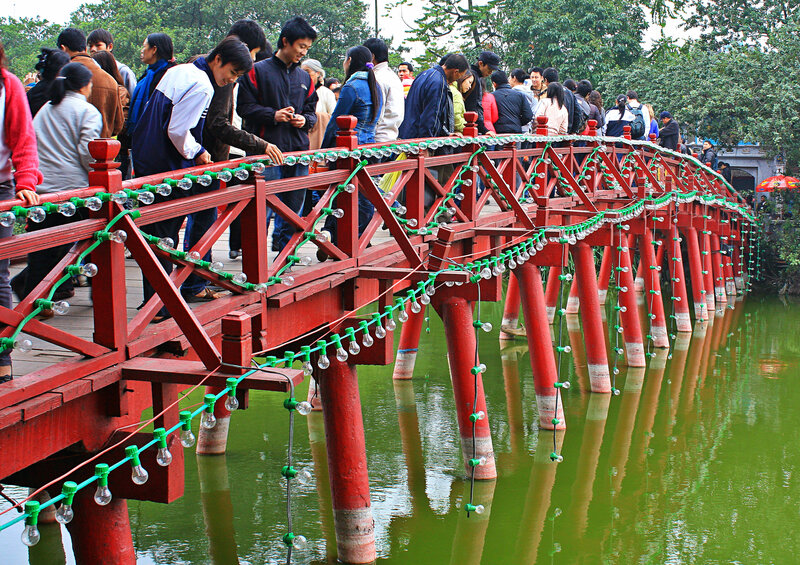 One of the most scenic images of Hoan Kiem Lake is the illuminated Bridge of the Rising Son that leads to the Ngoc Son temple. Experience Hanoi’s rich cultural history by taking in a traditional Vietnamese show at the Thang Long Water Puppet Theatre, located across from Hoan Kiem Lake. 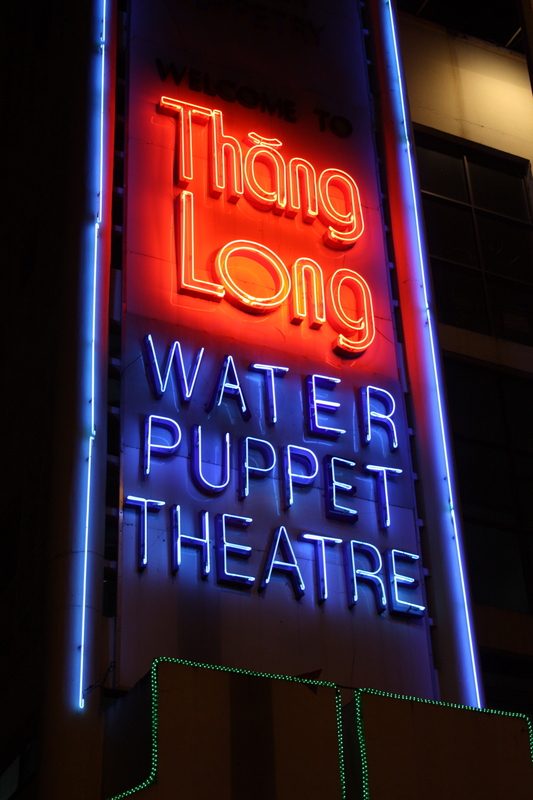 This lively puppet show is a must see for any visitor to Hanoi. Puppeteers and live musicians enact traditional Vietnamese tales using intricately designed wooden puppets that splash and move across a watery stage. Escape the crowds by ducking in for a cup of coffee at nearby Highland’s Coffee, located in the five story building overlooking Hoan Kim Lake. Anyone of the viewing decks in the building is a great place to watch the endless parade of scooters and crowds down on the street from high above. Hanoi’s Old Quarter is filled with a variety of colorful shops and markets. Traditionally many of the city streets are named after the items they sell. For example Hang Gai is known for items made of silk, Hang Ma sells paper decorations and Hang Bo sells baskets. This area is coined the original 36 streets as it refers to the original guilds established there and the items they sold and produced. Now the Old Quarter consists of over 70 streets selling everything from hand tailored suits to souvenirs. Located on the far northern end of the Old Quarter is the Don Xuan Market. This historical market is Hanoi’s largest and oldest covered market. One distinct feature of the Old Quarter is its unusual architecture. 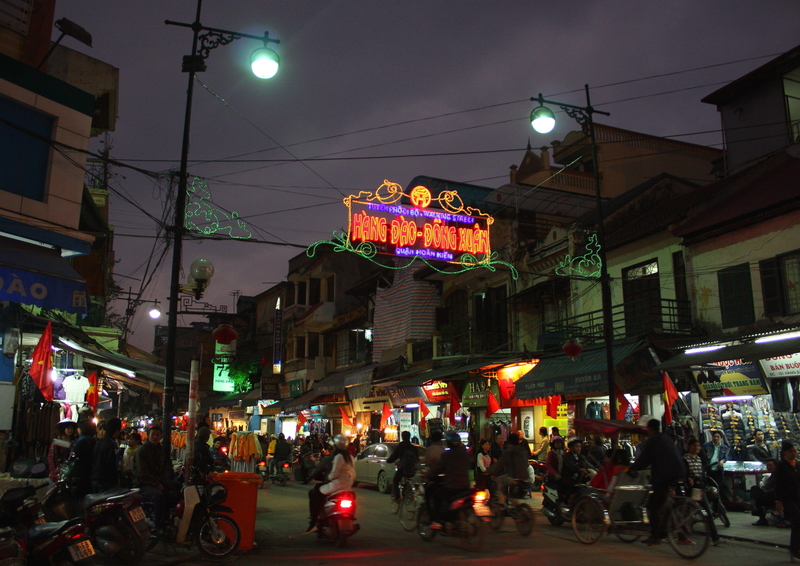 Many of the buildings are a fusion of Vietnamese and French influences. One style specific to Vietnam is called a tube house, these buildings line the Old Quarter streets and typically house a business on the ground level and the top floor is a narrow and tall tube-like living space. Visitors to the Old Quarter will have to try the regional specialty Pho; a traditional noodle soup served with slices of beef or chicken and fresh bean sprouts. Pho is available at any number of crowded small store front restaurants that line the streets of the Old Quarter. The Old Quarter is best explored by walking, but even those equipped with a detailed map and the best navigational skills will have a hard time maneuvering the streets according to plan. 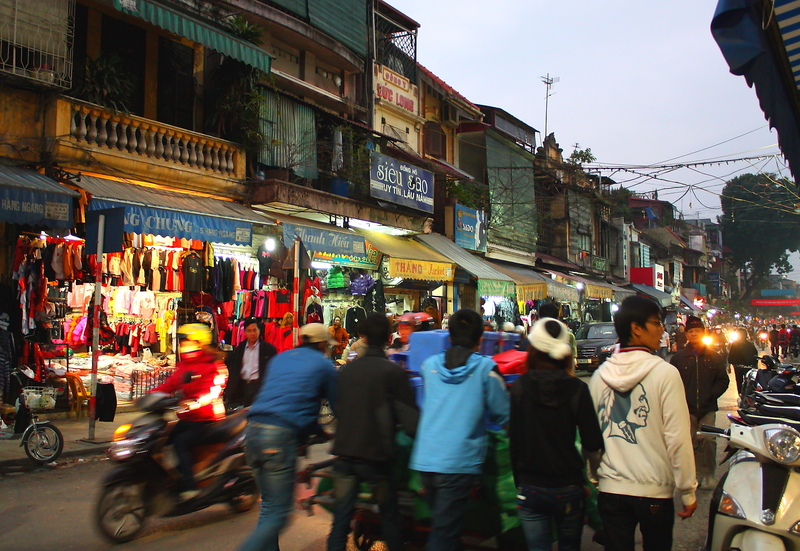 Part of the charm of Hanoi is getting lost in the maze-like streets lined with colorful shops and overflowing markets. Aside from walking, an exciting way to tour the city center is by Cyclo. These bicycle or scooter driven taxis are fun and safe way to experience the lively and crowded streets. It is essential to negotiate the price before getting in to ensure the best deal. Visitors to South Asia will enjoy Hanoi for its unique fusion of French, Chinese and Vietnamese influences, its endless shopping opportunities, and the hustle and bustle of every day life. This entry was posted in asia and tagged asia, hanoi, Ho Chi Minh City, Hoan Kiem Lake, old quarter, South Asia, vietnam, Vietnamese, Vietnamese language. Bookmark the permalink.